PRP has been used in many areas of medicine, including the acceleration of healing of tendon injuries, the treatment of osteoarthritis and dental procedures. The concentrated form of plasma has been shown to accelerate wound healing and tissue repair and, thus, could potentially benefit skin rejuvenation and hair restoration procedures in cosmetic medicine. How do you enhance your natural beauty? We know that it can be frustrating trying to find the best aesthetic procedure since there are so many options to choose from! At Butterfly Medical Spa we offer a variety of procedures including Laser treatments to Botox injections. However, we are incorporating to our practice the latest trend that has been used successfully for years to improve the appearance of fine wrinkles, scars, sun damage, and to help treat dark circles under the eyes. The treatment, Platelet-Rich Plasma is gaining popularity, due to its great results and organic nature. We use Plasma taken from the patient’s own blood, which means side effects are practically nonexistent because the body will not reject its own blood. After drawing a small amount of blood, we place the drawn blood in a sterile tube, which is centrifuged to separate the different components of the blood (red and white cells) where the Plasma now contains a high concentrate of platelets, which is called Platelet Rich in Plasma (PRP). Platelets are the cells in our body that help tissue heal and grow new cells. When injected into specific areas of the skin, it boosts collagen, and regenerates tissue, creating tighter and smoother skin. Microneedling, uses micro-needles to puncture the skin creating a controlled destruction of certain cells deep within the skin, this procedure triggers the body’s natural process to stimulate the collagen, another benefit of this procedure is how it prepares the skin to absorb topical treatments. Combined with the PRP these two therapies work in synergy to accelerate results. Side effects after both procedures tend to be minimal, there might be some redness, swelling, slight bruising, or mild peeling. These side effects tend to disappear within the next few days after the treatment. Patients may need several treatments depending on their skin type. Advanced issues (scars or deep lines) may require additional treatments. The only way to determine how many treatment(s) you will need is by consulting with one of our specialists. Call us today to schedule your next appointment! You are only one step away from having tighter smoother skin! 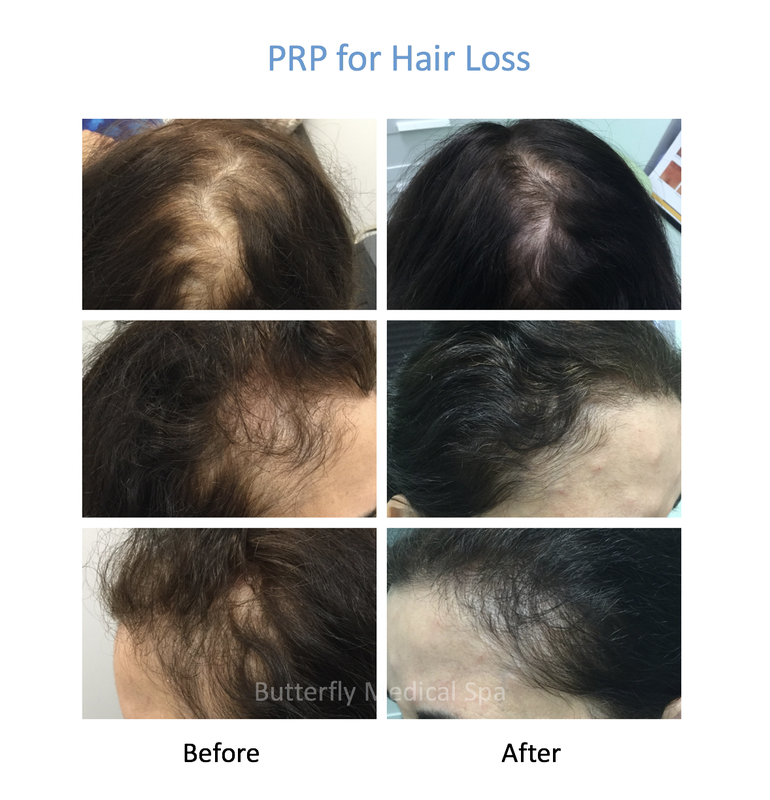 Am I a good candidate for PRP treatment for hair loss? In the medical treatment of male and female pattern baldness (androgenetic alopecia), PRP can be injected into the balding scalp to potentially stimulate thin hair to grow into thicker hairs. Patients with thinning, but not totally bald, areas would be the best candidates. After blood has been drawn from the patient, it is then centrifuged in order to separate the blood cells from the plasma and the platelets (which repairs damage and injuries). Patient will receive local anesthetics to make the treatment as painless as possible. Then the scalp will be injected in a grid pattern in the treatment area. In many cases, microneedling will be added based on patient's situation. Overall, it is recommended to have at least four sessions of PRP hair loss treatment to see successful results. These sessions are ideally spaced 4-6 weeks apart for best results. The results may vary. This is new treatment for hair loss and several studies have been published which have shown significant improvements in hair loss and thinning. The scientific publication about PRP treatment for hair loss can be found here.